I’ve been knitting up a storm lately- but unfortunately (or, if you look at it another way, fortunately) it’s mostly been “work knitting.” Now, don’t get me wrong, I’m beyond thrilled that I can count myself as a “professional knitter,” but sometimes I long for the day when I could just knit whatever I wanted, whenever I wanted without deadlines or due dates. I’m crazy busy, but whenever I have a few minutes free, I’ve been slowly chugging away, working on a project just for me. It’s fun, it’s straightforward, and it doesn’t require me to do any math! Woo! 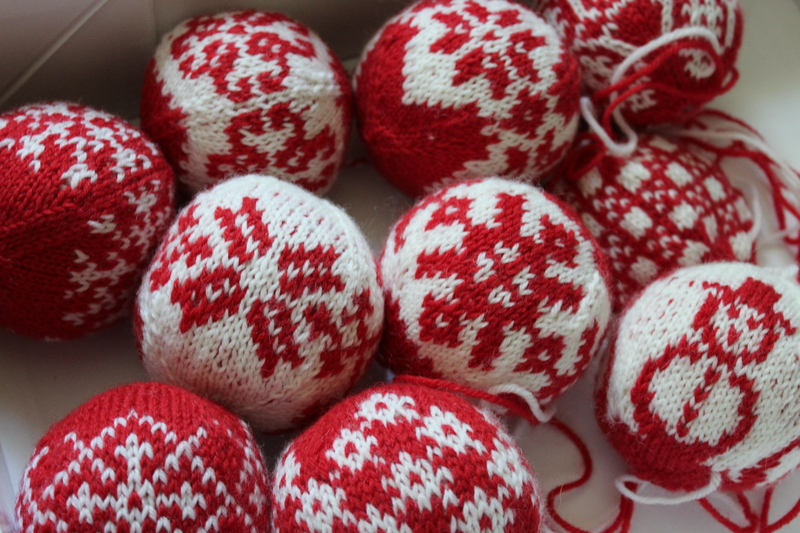 Since I got Arne & Carlos’ book 55 Christmas Balls to Knit, I’ve dreamed of a Christmas tree covered in their adorable red and white ornaments. I bought a big bag of red and white yarn in January, and I’ve slowly been making my way through the book. So far, I’ve completely finished 3 balls, stuffed 6 more, and have one freshly off my needles. They’re quick little projects- it takes me an evening to knit up a ball (not including finishing). And, its great to be able to just follow a pattern, knowing that it’ll turn out great. Have you been working on any “just for fun” projects lately? This entry was posted in On My Needles and tagged arne & carlos, ball, christmas, christmas balls, christmas ornament, knitting, ornament on July 19, 2017 by onemilljellybeans.